Scope – Installation of new fuel storage tank piping supports to replace existing pipe supports that have shifted due to frost heaving. The intent of the project was to install new concrete support piers deep enough, with PVC pipe encasement and backfilled with a bentonite grout mixture so as to prevent the earth from gripping the piers and causing future frost heave. 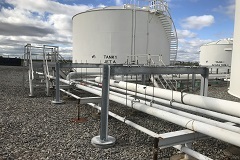 Structural steel was installed onto the new concrete piers and the fuel piping was then hung with thread rod and clevis supports. Additional lateral sway support angles were then installed at four intermediate support locations to dampen hammer action resulting from fuel pumping.